our program an unique experience. All kids who register for football will be automatically registered for the camp at no cost. CCYS offers a premier tackle football program that competes against other youth clubs in the Arapahoe Youth League. Participation is available to youth ages 6 - 14 (Grades 1st - 8th), with 3 levels of competition in most grades. We will be scheduling more exciting opportunities for the kids throughout the season at the high school games and events! See below for more information. This season is shaping up to be one of the best. The following is a list of important dates for this season. It will be updated as more information becomes available. Practice times and locations may be altered due to weather, field conditions, coaches request, etc. Register early to avoid placement issues as teams fill fast! Please email us at if you have any questions, are interested in volunteering, or would like to apply for a scholarship. Please complete a scholarship application if you would like to make a request for a scholarship (note* please allow up to 2 weeks for processing. Only partial scholarships can be granted and are given on an as needed basis only). Any/all out of district requests are automatically disqualified, sorry. All scholarship request must be received prior to Late Registration beginning! Grade/Age: A player's eligibility for the season is determined by the grade he is entering in the fall, as well as age on May 31st, of the current year. No player who has attended high school classes will be permitted to play in the AYL, regardless of age. All AYL teams may conduct voluntary workouts starting May 1st and continuing until the official practice start date. Teams may have 1 workouts per week. Teams will not be allowed to wear pads, and workout must be non contact during this period. All players MUST be FULLY registered with CCYS before they can attend ANY team activities. *NOTE: Not every team will elect to participate in pre-season workouts. Practices will be held on weeknights and possibly weekends during the pre-season. Teams will hold 2-4 practices a week, depending on the age and level of the team. Once games begin, practices will be held primarily on weeknights. All practices will be held at the parks and fields within the CCYS territory as determined by your coach. Practice schedules will be communicated by your coach one to two weeks prior to the practice season start. Practice schedules are subject to change throughout the season. Coaches can conduct workouts (one time per week) starting in May. Not all teams will participate and is facilitated by coaches only. NFC - Represents the most experienced players and the highest level of competition in our league. AFC - Represents the largest number of players in our league. It is for more experienced athletes playing at a competitive level. CFC - This represents our entry level of play and is intended for only those at an early level of experience (1st or 2nd years). Coaches are required to attend all coaches meetings or send a representative in their place. Coaches will be contacted by email for all meetings. Head coaches are required to register by May 1st, click on the Coaches Registration link in the left menu on this page. All football head coaches must be considered "in-district" as defined by CCYS. All coaches are required to complete USA football Level 1 Certification, failure to do so may result in suspension from coaching. Codes for free registration will be available from the football commissioner prior to the season. A blue and a white game jersey are required for all players. We will be holding a jersey fitting day(s) in June and will send information to those registered and will post information on the website as it becomes available. Helmets will be white with blue or grey facemask. Game pants color will be decided by your teams coach. You are welcome to purchase football equipment (helmet, shoulder pads, mouth guard, cleats, etc.) from any retailer you choose. 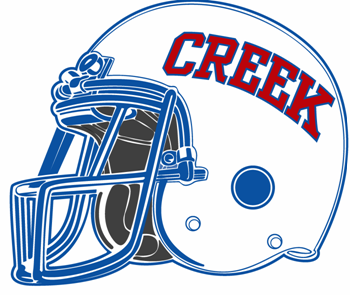 Please wait to have team equipment information from your coach or email contact@creeksports.com with questions prior to purchase to avoid confusion. Have questions or need more information? Contact the Football Commissioner at . Last year, USA Football completed a two year study that determined actual facts surrounding injuries associated with youth football. 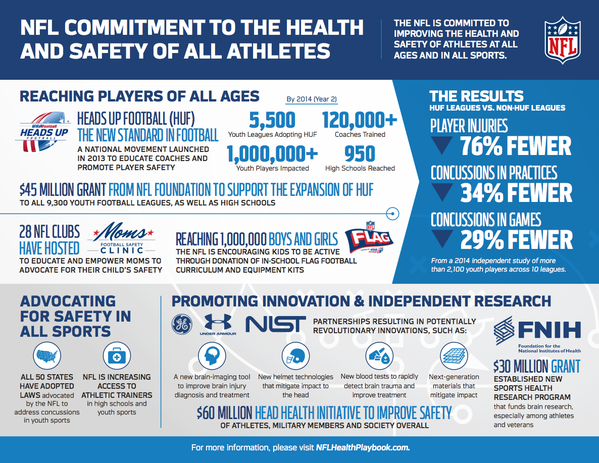 This year, USA Football continued their study by evaluating the impact of the USA Football's Heads Up Football program on youth football injuries. The results are amazing - this independent study found a 76% reduction in injuries for leagues participating in the USA Football program vs. leagues that do not take part in the program. This year's study by the Datalys Center involved over 2,100 players, ages 5-15, across 100 teams and 10 youth organizations spanning four states. The number of players from leagues committed to using USA Football's Heads Up Program were over 1,400 players while those players from leagues not using the Heads Up Program were just over 700 players. The two-to-one difference in players using the Heads Up Program vs. players from leagues that did not use the Program was used to balance its youth football safety surveillance data for the 2012-13 study. Players in Heads Up Football leagues were 57% less likely to sustain a time-loss injury, while more than 90% of youth players in Heads Up Football leagues did not sustain an injury in games or practices during the 2014 season. In three years of research (2012-2014) encompassing more than 6,000 players ranging in age 5-15, only 2.8 percent of all players had sustained a concussion. Bruises were the most common injuries reported (27% of all injuries), followed by ligament sprains (22% of all injuries). As many of you already know the CCYS Bruins and the AYL are total committed to making football a "Better Safer Game."